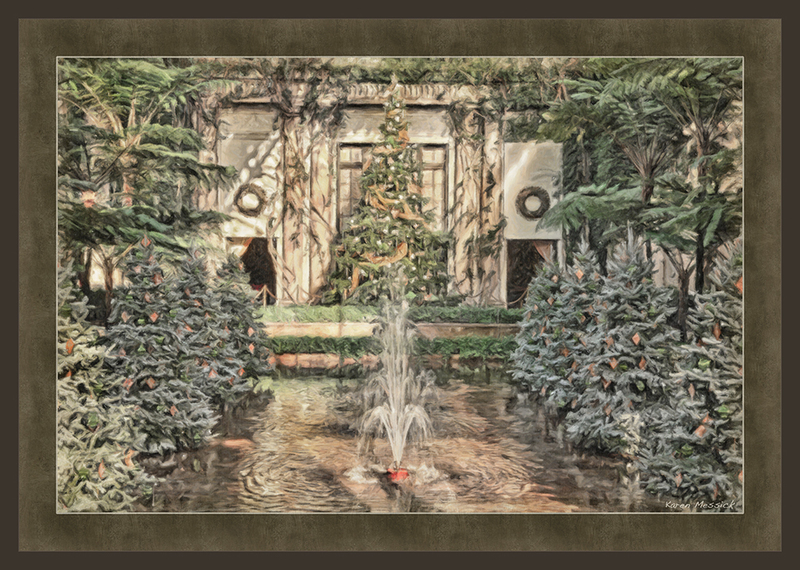 Just finished working on a few more shots I made at Longwood Gardens on Wednesday, when I was enjoying their Christmas displays in the conservatory. 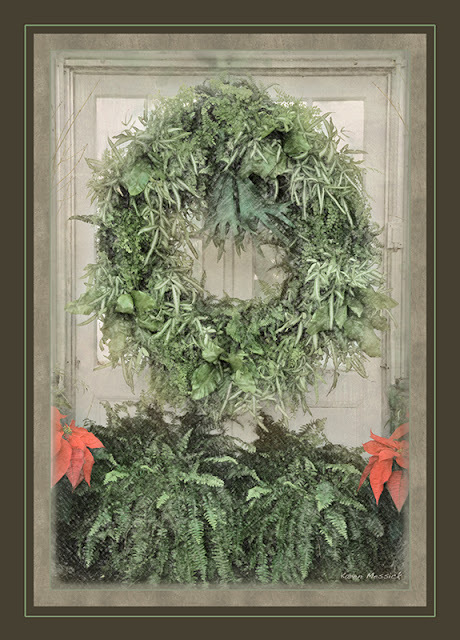 The image above, a wonderfully creative fern wreath, was a single shot worked in Snapart3. I made two renditions of this image in SnapArt3; one that was a paint effect and one that was a sketch effect....and blended the layers in Photoshop with selective opacity....this idea had its roots in iPhone processing. Now there is a benefit in making and processing iPhone images....a crossover process using DSLR software programs. I added a texture layer and reduced the opacity and made selective masking adjustments with the texture layer as well. I also added some edge effects in OnOne PhotoFrame Pro. This image is an HDR image, processed in SnapArt3 with two layers of effects and OnOne PhotoFrame was also applied to achieve a border effect, in addition to Photoshop. This image is also an HDR image processed in Nik HDR Efex Pro, and then in SnapArt3. 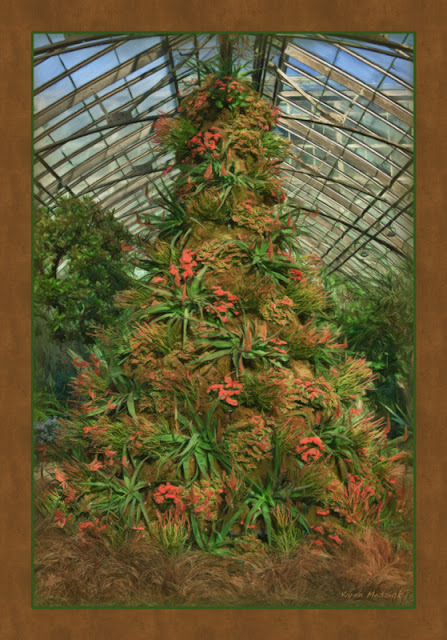 This is one of the most unusual Christmas Trees I have seen at Longwood in their Mediterranean Room. I think they really stretched their creativity to create holiday icons with plant matter this year. The tree in the Desert Room was equally interesting made entirely from succulents and with no artificial adornments. I love the creative methods you used to make these images special. It was a wonderful workshop and i enjoyed the other participants and the beauty of Longwood. Absolutely fantastic set of images Karen! You are so creative! Beautiful. Amazing. You are an original! Thanks very much Sue,Nancy and Dave for leaving a comment here! Hope you all have a wonderful holiday?